Save state space report tool to a sheet containing a page from the net. A save dialog box will appear. Specify the location and name of the report file you want to create. The contents of the report are determined by the options for the Save state space report tool. The textual format of place and transition names in a report can be changed by setting the string representation options. To set these options, you must change attributes and options. Tool options for the Save state space report tool determine whether home, live transition instances, and fairness properties should be included in a state space report. These properties can be calculated only if the SCC graph has been calculated. If these properties should be included in the state space report and the SCC graph has not been calculated, then an SccGraphNotCalculated exception will be raised after the Save state space report tool has been applied. 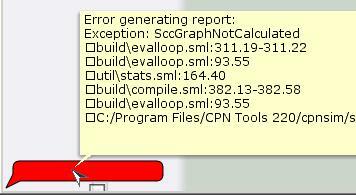 To solve the problem, calculate the SCC graph, and then apply the Save state space report tool again.